David Behrman has been active as a composer and artist since the 1960s – making sound and multimedia installations for gallery spaces as well as compositions for performance in concerts. My Dear Siegfried, Leapday Night, On the Other Ocean, Unforeseen Events, lnterspecies Smalltalk, Long Throw and Open Space with Brass are among Behrman's works for soloists and small ensembles. In the 1970s, he collaborated with Robert Watts and Bob Diamond on the video and sound installation Cloud Music; in the 1980s, with George Lewis and Paul DeMarinis, he made installations for the DeCordova, Hudson River and La Villette museums. His most recent installations were Pen Light (2002) and View Finder (2006). Together with Robert Ashley, Alvin Lucier and Gordon Mumma, Behrman founded the Sonic Arts Union in 1966. Sonic Arts performed extensively in North America and Europe from 1966- 76. It presented programs again recently at the MaerzMusik Festival in Berlin and The New School, New York. 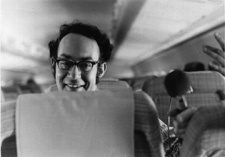 Working at Columbia Records in the late 1960s, Behrman produced many of the "Music of Our Time" series of new music recordings for Masterworks and Odyssey. Among them were the first recording of Terry Riley's In C as well as his Rainbow in Curved Air, and works by Robert Ashley, John Cage, Mauricio Kagel, Alvin Lucier, Richard Maxfield, Gordon Mumma, Pauline Oliveros, Henri Pousseur, Steve Reich, David Tudor, Christian Wolff and other influential composers. Behrman worked extensively with the Merce Cunningham Dance Company, creating music for several repertory dances, from Walkaround Time (1968) to EyeSpace (2007). In 2004, he became a member, with Christian Wolff, Takehisa Kosugi and John King, of the company's music committee, which oversaw music issues during the last seven years of MCDC's existence. During the 1960s and 1970s, he assisted John Cage and David Tudor with several projects, like 9 Evenings: Theatre and Engineering (EATJ in 1966. Behrman was co-director of the Center for Contemporary Music at Mills College from 1975-1980 and has returned to Mills as visiting artist/professor several times since then, most recently in February 2013. He has taught also at Cal Arts, Rutgers, Ohio State and the Technical University in Berlin and has been a member of the Milton Avery Graduate Arts Program faculty at Bard College since 1998. Currently, Behrman is working on an orchestra commission for the BBC Scottish Symphony. My Dear Siegfried... (and other works), Experimental Intermedia, XI 129 2CDs, 2005. Wave Train, Music from 1959 to 1968, "Canons", "Ricecar", "Wave Train", "Players with Circuits", "Sounds for a Film by Bob Watts", and "Runthrough". Alga Marghen Italy B 5NMN.020, 1998. Behrman, "Designing Interactive Computer-based Music Installations," Contemporary Music Review, Harwood, London, 1992. Howard Pollack, "A New Age and a New Left: David Behrman and Frederic Rzewski," in Harvard Composers: Essays on Walter Piston and His Students, Scarecrow Press, 1992. Mamoru Fujieda and Toshie Kakinuma, "David Behrman's Electronic Art," Ongakugeijyutsu, Tokyo, August 1991. A recent interview with Teresa Stern, in Perfect Sound Forever.